CNN Photos proudly presents exclusive photos of Mother Teresa in A Force for Good: When a legendary photographer met an iconic missionary, featuring the work of renowned photographer Mary Ellen Mark (1940–2015). This multimedia presentation features photos taken by Mark on an once-in-a-lifetime assignment with Nobel Peace Prize laureate Mother Teresa. Mark’s photos of Mother Teresa and her Missionaries of Charity were taken almost 30 years ago while on a feature assignment for Life magazine. Despite Mother Teresa not wanting to be photographed initially, Mark’s photos feature her in an intimate manner with the images placing the viewer in the presence of Mother Teresa. The photo series brings together two seemingly different women who share a commitment to understanding the people and the world around them. While neither of the woman are currently alive (Mark died in May 2015 and Mother Teresa died in September 1997), the treasured black-and-white photographs of their time spent together still live on. 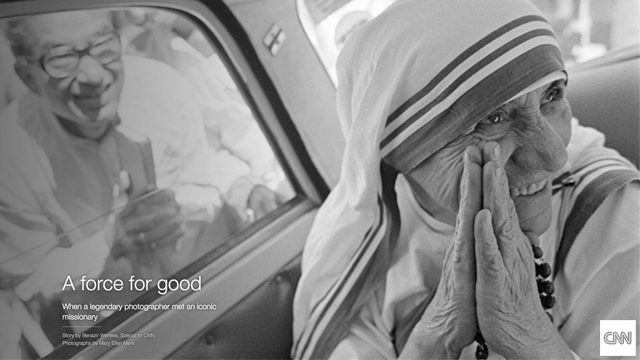 Explore “A Force for Good” exclusively on CNN Photos as Mother Teresa is to be canonized by Pope Francis on September 4, 2016.